Over the past many months of exploring the Four Foundations of Mindfulness, we have looked at the nature of impermanence. We’ve looked at physical form, the world around us and our own bodies, and we’ve seen that the only constant is change. We’ve also come to understand that there is no separate self, that every time we think we can say ‘I am this’, when we investigate we see that we are not that. So there is no isolated fortress of self that we need to defend. We have learned Anicca (impermanence) and Anatta (no self). These are two of the three Marks or Characteristics that are key to understanding the nature of things. The third mark or characteristic is Dukkha, the quality of unsatisfactoriness that is part of this experience of being alive. Understanding that there is dukkha is the First Noble Truth. Let’s look more closely at what the word actually means. It’s tricky because there is no perfect English translation. 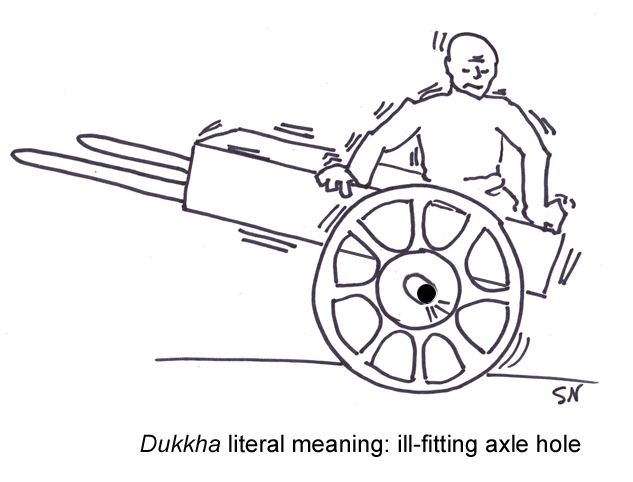 The word dukkha, when broken down into root parts literally means an ill-fitting axle hole. Now that would be very uncomfortable wouldn’t it, to be on a journey and at every turn of the wheel there’s a jolt from the wheel not being properly fitted? Staying with that image, we can all think of at least a time in our lives when this was certainly how it felt. And if we look closely at the nature of things, we might recognize that quality of ongoing friction or the wheels of our lives being slightly out of balance. This is the quality of suffering the Buddha asks us to acknowledge. For many of us when we hear the word ‘suffering’ we don’t think of ourselves. We look around at all we have, where we live, all our good fortune, and we feel we would be ungrateful to see suffering in our lives. We put suffering outside ourselves in those who are victims of all the natural and man-made disasters in the news, and certainly there is pain in the world and our compassion is called upon to acknowledge it and perhaps act on that acknowledgement with generosity of spirit, time and resources. But the kind of suffering we are talking about here is a chronic human condition that most of us ignore. When we tie suffering only to a particular cause or condition, then as long as the conditions of our life are fine, then we are not suffering. If we and our loved ones are healthy and none of them has died recently, then we are fine. We are blind to the chronic suffering of ourselves and others, because we just look at the nice house, the shiny car, the successful career, the healthy body, etc. and conclude that we or they must be happy. But if we are really paying attention, we might notice that even when everything is fine we hope these conditions will continue and fear illness, turns of fortune, aging and death for ourselves and our loved ones. This wanting things to stay the same or wanting things to be different is dukkha, and it’s universal. We may feel we have no right to such feelings, given all these favorable conditions, so we hide our fear, subsume our feelings in self-destructive behavior, and/or focus on the ‘positive.’ We may ignore the truth that gnaws inside us and we create a false persona. Constantly trying to sustain that false persona is one bumpy ride where we never feel completely at ease, isn’t it? So the Buddha asks us to look at dukkha, that ill-fitting axle hole of life experience, and acknowledge it. That is the First Noble Truth. Fortunately there are three more Noble Truths that disprove the rumor that Buddhism is a gloom and doom tradition. In fact, there is infinite joy in the Buddha’s teachings. But the joy is not conditioned on external causes. As we explored in the Awakening Factors in the previous post, this joy is a pervading quality that arises out of the practice of being fully present and compassionate with ourselves when we haven’t been present. We can experience a quiet balanced sense of joy and gratitude regardless of what we are going through in our lives, regardless of the bad news we’ve just received. This is not a training to be insensitive or uncaring. It’s a training in being spacious enough to hold all that comes in loving kindness, compassion and equanimity. If you’ve been following along in our investigation of the Four Foundations of Mindfulness, you might notice that this quality of dukkha pretty much sums up what it’s like to live with the Hindrances and Aggregates we studied earlier. The Five Hindrances are: lust/craving, aversion, sloth & torpor, restlessness & worry, and doubt. The Five Aggregates — our body, our preferences, our knowledge or understanding of the world, our urges and intentions, and our consciousness — get us into trouble when we believe them to be permanent, separate and under our control. Not understanding annata (impermanence) and annica (no self) leaves us with the experience of dukkha (suffering). Conversely, as we come to understand the nature of annata and annica, then we develop the ability to be soften and even dissolve patterns of dukkha. 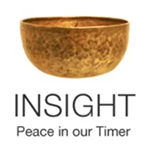 So we can see why the Buddha developed the Four Foundations of Mindfulness: Through them we can see for ourselves the truth of impermanence and no self, and we are given the tools to release suffering that we create in our lives. This is an ongoing practice, so do not despair if you feel you haven’t ‘got it’. Just keep practicing the paired intentions to be present in this moment, anchored in physical sensation, and to be compassionate with yourself when you discover you haven’t been present at all. Remind yourself that in this moment of recognition you are present! That is cause for celebration not harsh judgment. This entry was posted in dukkha, First Noble Truth, Four Foundations of Mindfulness, http://schemas.google.com/blogger/2008/kind#post, suffering, three marks on June 30, 2013 by Stephanie Noble. I attended a dharma talk by Rick Hanson this week about the Three Marks or Characteristics: impermanence (anicca), the universal sense of unsatisfactoriness (dukkha), and no-self (anatta). Then Thursday our traditional brief reading of an excerpt from ‘Pocket Pema (Chodron)’ also happened to talk about them. So I shared with the class a little of what Rick had said because I felt the way he explained the relationship between the three, rather than just listing them, was very useful. He said that impermanence is a given. (This is exactly what we have been learning week after week in our exploration of the Five Aggregates.) But we have the choice of whether to react to it with the grasping, clinging and aversive reactions that cause suffering –dukkha, or respond to it with anatta, no-separate-self, and hold the impermanence of experience with ease and even joy. So, thanks to Rick for that nugget of wisdom. As we have looked at each of the Aggregates over the past weeks, we first recognize the quality of impermanence. All arises. All falls away. Sometimes immediately, sometimes eventually, but if you attend it closely you’ll see the process is always in cycles of motion. What a relief to discover that we do not have to shore up or cling to a sense of separate self in order to be happy. So if you have been asking the perennial student question How will this help me in real life? here’s your answer! Everything we learn as we explore the Buddha’s teachings, and as we create through meditation practice the opportunity to have our own insights, is for one purpose, and one purpose only: To create spacious ease and happiness in you, that you may be in the world as a conduit of loving kindness, compassion, joy and balance. We all have created suffering through unskillfulness, and we have all witnessed how suffering in one person can activate sometimes extreme suffering in others. What can we do as witnesses? So much depends on the situation, of course, and one hopes that our practice gives us the presence of mind to respond skillfully. But even when we are thousands of miles away watching on television a horrific event unfolding before our eyes, as many of us did this past week, there is still something we can do. Metta is universal loving-kindness that is a powerful practice we can do at any time. It is especially useful when we feel overwhelmed and things seem to be spinning completely out of our control. Send metta to the victims, to their families, the first-hand witnesses, the responders, and yes, to the perpetrators of this act. Whoa! What? Why would we send loving-kindness to them? Think about it. Their incredibly unskillful violent means of making whatever statement comes from such an unstable delusional place. So we send metta to them. ‘May you be well.’ Yes, may you be well enough in you mind to understand that this is not the way to make your concerns known. ‘May you be happy.’ Yes, if you were happy in your own being, you would never have thought up this violent scheme in the first place. ‘May you be at ease.’ Yes, it is the dukkha-driven restlessness and dis-ease that brought this thought to painful action. ‘May you be at peace.’ Yes, if there were peace in your heart, you would never have thought up this action in the first place. Although we don’t send metta with the hopes that people will be different from who they are, still metta does have transformative power. But it is only powerful if it is as generous as the sun, shining on all life, not just sent out selectively to the ‘deserving’. We challenge ourselves to recognize that sense of no separate self. We cannot send metta only to sweet-faced children or baby animals. We make no distinction while sending metta between those who we think deserve a good life and those whom we might instinctively wish hell on earth for the suffering they have caused. Metta is not a reward. It is a universal well-wishing that actively creates a peaceful world. Those who are kind and generous do so because it flows through them as a natural response to the goodness they know to be the world they live in, even as they see unskillful painful behavior erupting sometimes. Those who do violence do so because that is the world they know, the people they hang out with, the path of least resistance. This is not to justify their actions. It is to settle the reactivity that forces more actions and reactions within the rest of us until the violence feels entrenched and permanent. It is not permanent. When we allow the violence of others to activate the same violence of spirit within ourselves, then we are seduced by Mara, the tempter*, into mindlessness and unskillfulness. So we say, as the Buddha said again and again, ‘Ah Mara, I know you.’ Because we do recognize that quality, we are tempted by it from time to time. But knowing it for what it is, we see through it. We are spacious in our minds and spacious in our hearts, radiating loving kindness to all beings. May all beings be well, may all beings be happy, may all beings be at ease, may all beings be at peace. The tempter, just like Mara, who tempted Buddha sitting under the Bodhi tree. And just as Jesus preached wholesome living, kindness and compassion, so did the Buddha. This entry was posted in anatta, anicca, dukkha, five aggregates, http://schemas.google.com/blogger/2008/kind#post, impermanence, metta, no self, three marks on April 23, 2013 by Stephanie Noble.